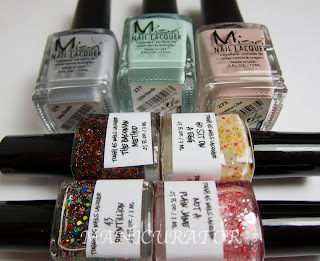 I'm happy to show you 4 more from Indie maker Tough as Nails today. Here's how to find her:Etsy shop, Facebook, Blog. "Looking for breakfast without all of the calories? * Try Breakfast Combo No. 1 with two great lacquers: The Baconian Method and Go Sit On A Egg! Go Sit On A Egg is a delicious almost white but still yellow jelly-based lacquer with gold, yellow, and orange hex glitters dispersed throughout. The poor grammar is intentional, and "Go Sit On A Egg" doubles as a lacquer and a great phrase that a beloved in-black-and-white child actor muttered in one of my favorite television series. Go Sit On A Egg tries to avoid chores as much as possible but usually gets stuck sweating in the kitchen making mush and milk. Try checking in the pole barn if you can't find Go Sit On A Egg, who just might be brushing up on the latest square dancing moves. This is 2 coats on its own. Love the milky yellow base, easy application. 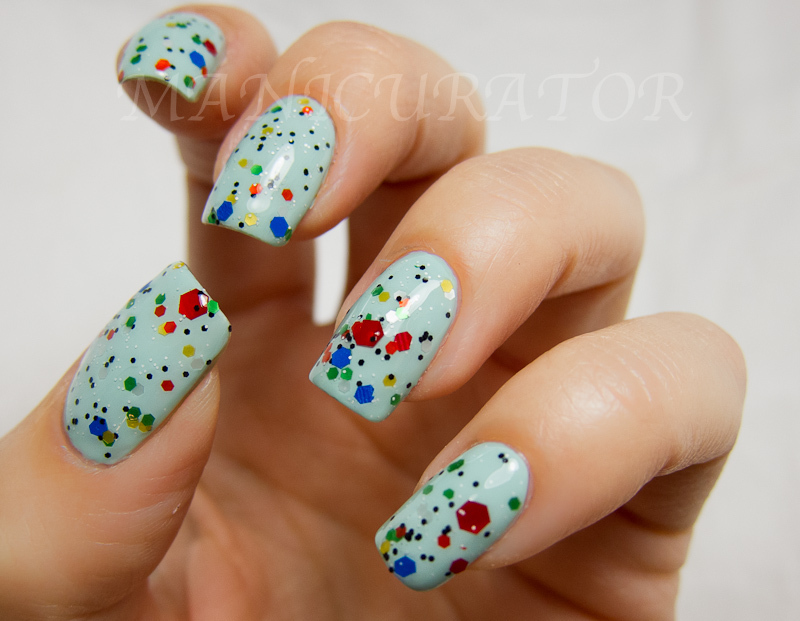 Layered over 2 coats Misa Someone like you. 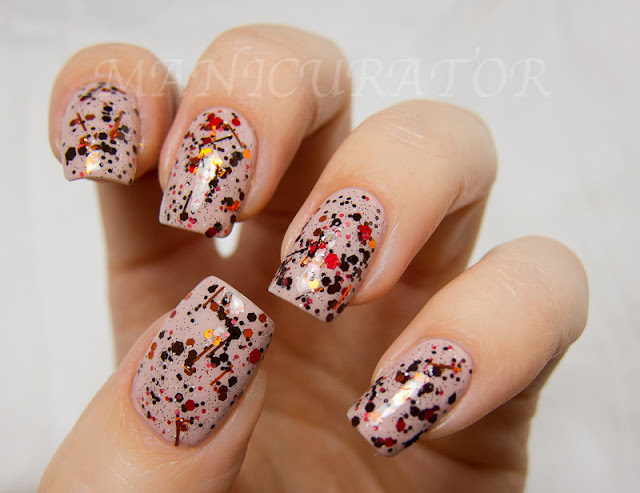 The Baconian Method is a brown glitter topcoat. It includes brown, orange, red, black, and white glitters in hex and bar shapes. The Baconian Method can be found in the lab, tirelessly experimenting to develop the next great waffle topping. This is one coat. Very unique! I had no issues of curling or bending glitters in any of these. Two coats of Misa Little Hands as my "undies". 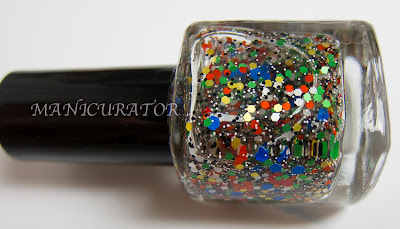 43 Quintillion is a topcoat lacquer. It contains hex glitters all of the colors you might find on a certain cube-shaped game from the 1980s, which happens to have forty-three quintillion combinations. 43 Quintillions is the life of the party -- she's a little bit wild, a little bit mixed up, and is always working to see how high she can get her bangs and how crimped she can get her hair. I've kind of had my fill of rainbow glitters, you know? But yet...this really got me, in a good way. She managed to get a rainbow glitter topcoat to look unique and I love it. 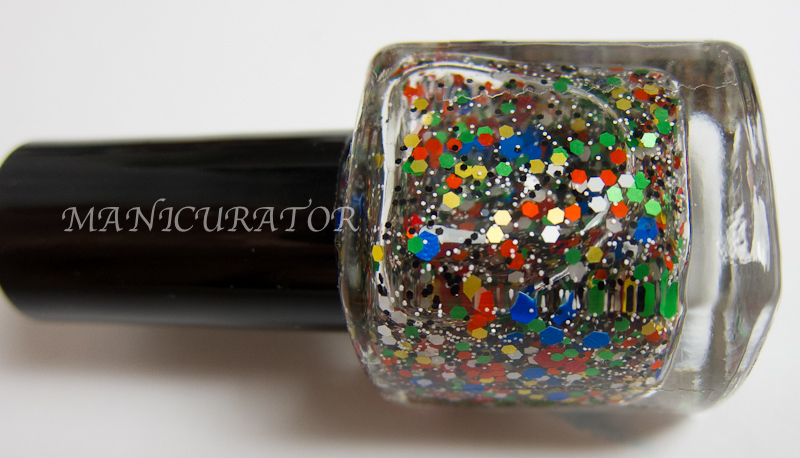 The white and black glitters and multisized rainbows are a really nice addition! Two coats of Misa Deep Breath, might be my favorite grey at the moment! 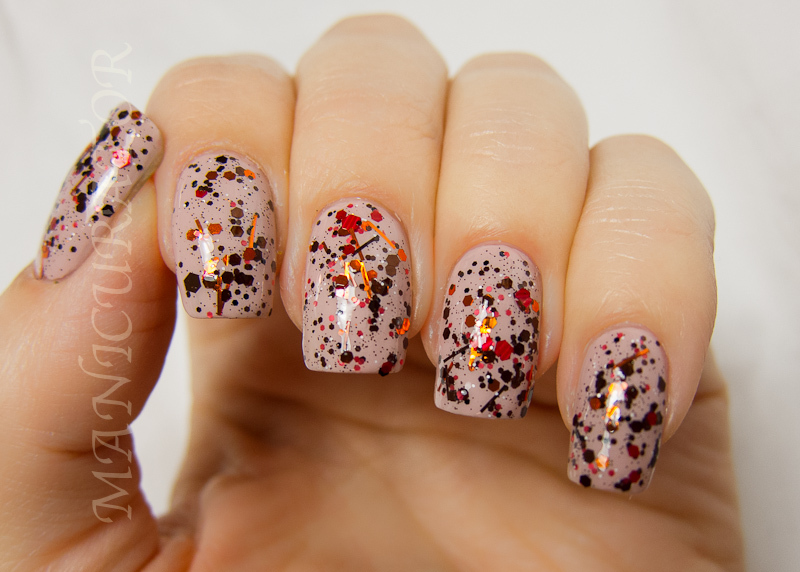 Not A Plain Jane is a topcoat lacquer, containing hex glitters in varying shades of white and pink, along with a few white hearts. Not A Plain Jane is named for one of my favorite people. She is sophisticated, feminine, completely fun, and known to sprinkle fairy dust in the lives of those she loves. Which is your fave? I have a hard time picking just one from this bunch. Yeah, they are really great! They are all great and I love the names! These are gorgeous! I especially love Go Sit on an Egg!! 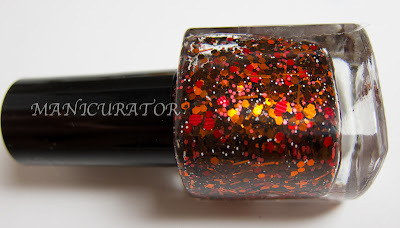 Not a Plain Jane looks so pretty over Deep Breath! I must admit glitter polishes are starting to royally get on every inch of nerves but these are soooo pretty. Love them! I love the names! The Baconian method is genius!